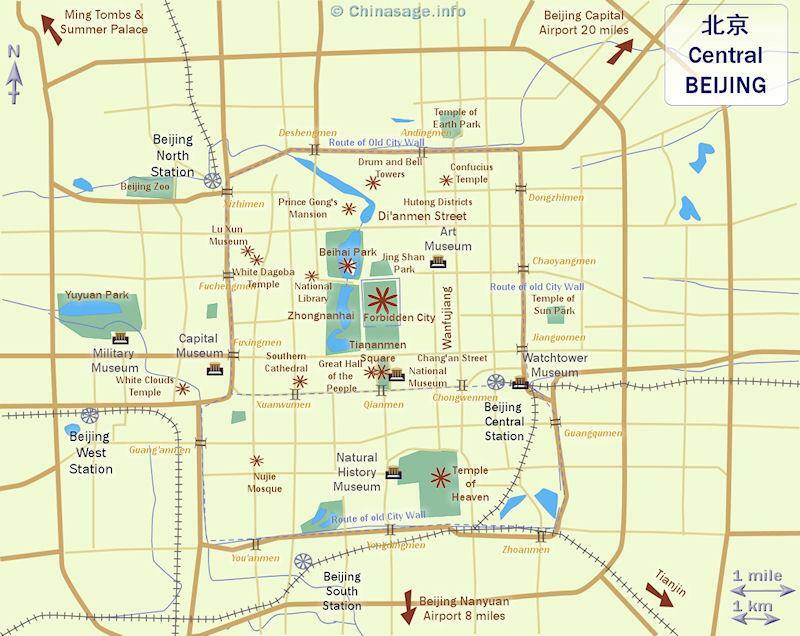 Beijing is the capital of China; its name means Northern Capital. Together with the cities of Tianjin and Shanghai Beijing was made a city municipality (at the same administrative tier level as provinces) in 1954. 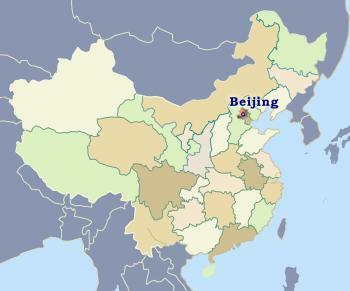 Geographically Beijing (still widely known as Peking WG in the Wade-Giles spelling) belongs to Hebei province that surrounds it. The shortened name of the city is just ‘Jīng’ meaning Capital. It nestles close to the Great Wall and for centuries controlled a strategic mountainous pass from Mongolia leading to the extensive North China Plain to the south and so became subject to repeated conquest, destruction and rebuilding. It also guards an important crossing point of the nearby Sanggang and Yang rivers. It was these rivers that provided the area with a rich covering of alluvial soil. Further on in this page we describe the important visitor attractions of the city: Forbidden CityTemple of Heaven; Beihai Park; Ming Tombs; Summer Palace; Old Summer Palace and Tiananmen Square. Fossil hominids ‘Peking Man’ (a form of Homo erectus ➚) from 750,000 years ago have been found nearby. Habitation by modern man began about 10,000 years ago. Ji, the first city founded near the site of Beijing was the capital of the Yan kingdom in the Warring States period. Its importance waned and only much later, during the Yuan dynasty when the Mongols established their capital Dadu Great Capital at Beijing did it become a large, bustling city. Beijing was greatly extended during the following Ming dynasty with the great dynastic administrative quarter The Forbidden City laid out according to Feng Shui rules. For details of the Ming city design see our Architecture section. During the following Qing dynasty the Manchus occupied the Inner (northern) city and the Chinese the Outer (southern city) separated by a wall. In Chinese tradition south is the most important direction and so the southern gate of the Forbidden City ‘Qianmen’ was the largest and most lavish gateway. The gate separates the northern Imperial district from the old southern town. The Imperial Dragon Throne faced south and was considered the very center of the civilized world. The city was one terminus of the ancient Silk Route which threaded it way towards Beijing from the west; while Tianjin to the south-east served as Beijing's port and industrial center; making Beijing an ideal site for the administration of the whole of China. The Boxer Rebellion 1898-1900 brought conflict to the heart of Beijing. On 20th June 1900 the German ambassador was killed and then they attacked the foreign legations, besieging them for 55 days. When the Western powers lifted the siege they exacted further humiliating concessions under the International Protocol of 1901 from Dowager Express Cixi. During the Nationalist (Republican) era 1928-1949 the city was renamed ‘Beiping Peiping WG’ (Northern Peace). The Marco Polo Bridge [Lugouqiao (卢沟桥)] is an ancient bridge over the Yongding River dating back to the Song dynasty. It was given this name because Marco Polo greatly admired it in a famous description. The bridge is 768 feet [234 meters] long with eleven stone arches. The parapets are decorated with stone lions, each one different. The Jesuit mission in 7th Feb 1688 described it this: “We enter’d the City by a Bridge, the finest we had yet seen: it is above 170 (geometrical paces in length; the Arches are small, but the Rails or Side Walls are made of a hard whitish Stone, resembling Marble. These Stones are more than 5 Foot long, 3 high, and 7 or 8 Inches thick, supported at each end by Pilasters, adorn’d with moldings, and bearing the Figures of Lions. I reckoned on one Side only, 147 of these Pilasters. Two little Banks, Half a Foot high, and a Foot and an half broad, run along the Rails. The Bridge is paved with great flat Stones, so well joined, that it is as even as a Floor”. It was repaired in the Ming and Qing dynasty after flood damage. On 7th July 1937 an incident near the Marco Polo Bridge marked for many the beginning of the Second World War, when Japanese soldiers fired on Chinese troops apparently as part of a training maneuver. For centuries administration has been the key activity of Beijing rather than trade or industry. It used to house the Hanlin academy and now has two top ranking Universities: Qinghua (Tsinghua WG) University and Beijing University. It boasts the largest rail station in Eastern Asia : The Beijing West Railway Station ➚. The Beijing dialect has been chosen as the standard putonghua/Mandarin language dialect which is the basis for the pinyin phonetic spelling of Chinese all over China. The Imperial Elephant Stables 象房 xiàngfáng stood near the Xuanwumen Gate. Elephants were used in key Imperial ceremonial processions and came from Vietnam and Burma. On the sixth day of the sixth month the keepers took the elephants for a good wash in the moat surrounding the city wall. The city boasts many places popular for sightseeing. The old Imperial Palace is number one on the list of sights to see. The Palace and other key attractions are described in detail later on in this page. Less well known are the Buddhist Green Cloud Temple (Biyun ➚) and Daoist White Cloud temple (Baiyunguan ➚); and the impressive Beijing Art Gallery ➚. The famous ‘Birds Nest’ stadium built for the 2008 Beijing Olympic Games ➚ is at Chaoyang just to the east of the city center. Ancient courtyard houses and hutongs are dwindling in numbers but some can still be seen away from the center, particularly around Prince Gong's Mansion ➚. Beijing Opera (Peking WG Opera) is world renowned as an ancient art-form which can be enjoyed in Xuanwu District; accomplished acrobats can be seen there too. For shoppers, many of the most popular shops are in Yansha and Guomao Shopping Malls; Wanfujing and Xidan Street. Beijing boasts many gems worth visiting a little further away, the Great Wall's most popular viewing point it at Badaling (八达岭) 50 miles [80 kms] to the north-west on the hills that guard Beijing's north and western approach. To the north west are the Summer Palace and the tranquil Fragrant Hills Park. Beijing has a cold winter (sub-zero most of the time) and a hot summer (up to 100 ° F [38 ° C]) and is plagued by dust from the Gobi desert. Air quality can be very poor; many Beijingers wear face masks to keep out the dust and pollution. 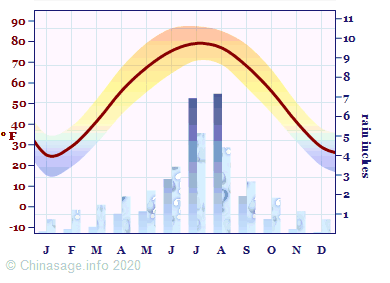 The barrier effect of hills to the north result in a higher rainfall around the area than further south on the plain. Lack of an adequate water supply is also a concern during long dry spells although schemes to transport water from southern China are beginning to come online. The Forbidden City in Beijing is one of the top tourist attractions in the world, attracting over seven million visitors a year. Beijing is formally laid out on a grid pattern with boulevards and avenues splitting the area into rectangles; the Forbidden City Zijin Cheng - Purple Forbidden City (in China purple was an Imperial color just as it was in Rome) lies at its heart. It is surrounded by a moat and only accessible through a few gates set in its thick walls. For more on architecture, and in particular the Ming design plan for Beijing please see our architecture section. Chinese people, after the Communist revolution call it 故宫 Gù gōng or Former Palace. Located close to flowing water and a key north-south meridian the city has excellent Feng shui. It was laid out in a symmetric grid fashion in the Ming dynasty just south of Dadu. The Forbidden City is ‘Forbidden’ because it was a closed community, the Emperor rarely went out of it (partly for his own safety) and the city was exclusively for the use of the Imperial court. As many of the buildings are of wood, fire and decay continue to take their toll, so today we see Qing dynasty (18th century) re-builds of older buildings; the City remains in a continuous cycle of repair and renovation. The Forbidden City is the largest and best preserved collection of ancient buildings in China; it covers 178 acres [72 hectares] and consists of over 800 buildings and over 9,000 rooms (some guides say 9,999 rooms as 9 is an Imperial number). It stands to the north of the vast open expanse of 天安门广场 Tiananmen Square and the main Meridian Gate is where the huge portrait of Chairman Mao Zedong hangs. The layout is broadly symmetric about the central meridian axis. The walls are painted a deep red to symbolize south and yang while the roofs are bright Imperial yellow symbolizing earth and yin. The main halls/palaces are on the center line and have poetic names for example the ‘Hall of Supreme Harmony (太和门 Taihemen)’ and the ‘Palace of Peaceful Old Age (寧寿宫 Qianlong)’. The Hall of Supreme Harmony is where the Emperor sat on the Dragon Throne and gave decrees; it is the largest and most splendid hall. Of the three ramps leading up to it, the central one was reserved exclusively for the emperor. Nearly matching it in splendor are the three halls to the north where the emperor would meet visiting envoys and delegations. The imperial living quarters were on either side of the main axis, and these included lavish gardens. The western section was occupied by the empress and concubines. In Ming times it is estimated there lived at least 800 ‘maids of honor’ and 3,000 eunuchs in the palace, so it was a very busy place. Many of these halls are now set out as specialist museums (jewelery; paintings; ceramics; bronzes etc.). Building began in 1406 with a workforce of 200,000 builders. Many thousands of families were forcibly uprooted and moved from the former capital of Nanjing to Beijing to build the new capital. The Ming Emperor Yongle moved in on New Years Day (2nd February) 1421. Some great feats of engineering were required in its construction, a great carved stone weighing 200 tons [181,437 kgs] was shifted by creating an artificial frozen surface for it to slide over. The buildings have only a few levels as they were built of wood making them less prone to damage by earthquake. The project demonstrated that the Ming dynasty had finally driven out the Mongols from northern China. The layout has water flowing in a curve through the Palace (giving it excellent Feng Shui). A stream called 'Golden Water' and five ornate marble bridges provide a grand entrance to the central halls representing the five Confucian virtues. Yongle's ambitions were soon smashed by a great storm on 4th May 1421 in which three great new palaces were struck by lightning and the throne was burnt to the ground. Such a clear sign from heaven drove Yongle into retirement and he abandoned the ambitious voyages of naval exploration led by Zheng He. This event was a major turning point in China's history, as China turned inwards, no longer much interested in the rest of the world. In 1664, the following Qing dynasty burnt down much of the palace but then it was rebuilt, maintained the same basic structure with strengthened walls 30 feet [9 meters] high and with a wider moat 165 feet [50 meters]. The Forbidden City remained in use up to the forced removal of Emperor Puyi in 1924. Internal Palace intrigues were the foundation of many tales. For instance, the Qing Emperor Guangxu had a favorite concubine Zhen Fei ➚ who aroused the jealousy of Dowager Empress Cixi and she was put under house arrest, ordered to commit suicide and when she refused to do so was pushed down a well. The center of government did not move far from the Forbidden City – the government buildings of the People's Republic are located immediately to the west at Zhongnanhai. The Temple of Heaven (天坛 Tiān tán) is located 3 miles [5 kms] to the south east of the Forbidden City, Beijing. More correctly the main round building is the ‘Altar of Heaven’ and ‘Temple of Heaven’ refers to several buildings and parks that make up the complex spread over 741 acres [3 sq kms]. The Temple was the location where important Imperial rituals were carried out to maintain the Emperor’s vital ‘Mandate of Heaven’ and was for his sole use. An annual ceremony required the emperor to Speak to the heavens 叫天 Jiào tiān at the winter solstice; chiefly to report on the year about to end. Later at the Lichun Spring festival the emperor dug a furrow with a special gold and ivory plow at the nearby Temple of Agriculture to symbolize the start of crop cultivation. He plowed three furrows, the princes six and the ministers nine, the tilled soil was then taken away and spread on fields. The Temple of Heaven is an impressive circular building with raised covered walkways. The temple is set at the center with a square park to the south representing ‘earth’ and a semi-circular northern area representing ‘heaven’. The association with heaven is emphasized by the many blue tiles of the temple's ceiling. The Chinese name for Hong Kong is 香港 Xiāng Gǎng meaning fragrant harbor. Hong Kong island was a British possession from 1842 until 1999 and runs on a semi-autonomous basis until 2049. Built by Yongle at the same time as the Forbidden City the Temple of Heaven is full of symbolism, it is the only intact Ming dynasty building in Beijing as others were later re-built or modified. The main ‘Hall of Prayer for Good Harvests’ (Qinian dan) has four great pillars to represent the seasons, an inner ring of twelve columns for months and an outer ring of twelve columns for hours (the ancient Chinese day had 12 divisions not 24). A central slab has dragon and phoenix patterns representing the Emperor and Empress respectively. The structure had to be extensively repaired following a lightning strike in 1889. The smaller ‘Imperial Vault of Heaven’ built in 1530 has blue ceiling tiles. Following ancient tradition where the Imperial yang number 9 is auspicious the geometric design makes heavy use of this number - stone slabs are laid out in concentric rings with nine more is each ring until the outermost ninth ring which has 9x9=81 slabs. It is traditionally measured at 99 feet high. Emphasizing the yang nature of the temple, women (yin) including baby girls were not permitted access at any time. The temple was built with ingenious acoustic properties, there are places where sound is funneled around the structure and other places producing two or three distinct echoes (the famous ‘Echo Wall’). Not a single nail was used in its construction. The surrounding park and gardens attract many visitors, some practicing Taijiquan every morning. Beihai Park is a famous spot in Beijing, located just north west of the Forbidden City. Beihai means 'northern lake'; the central and southern lakes of the Imperial complex now form part of the government district Zhongnanhai ➚ which is closed to tourists. Following traditional Imperial layout Beihai Park is dominated by a large Lake on which is Jade Island. The park was created as an Imperial garden in 1197 but not much developed until the Yuan dynasty made Beijing their Imperial capital. Kublai Khan built the man-made island and a palace (131 feet [131 feet] x 66 feet [66 feet]) on top of it. The palace was much admired by Marco Polo. There are many sculptures, shrubs and pavilions in the Park. Here also is the wall (照壁 zhào bì ) known as the Nine Dragon Screen ➚ made of glazed tiles (there is a similar one in the Forbidden City ➚). It has two ancient pine trees, one was made a 'marquis' ➚ by Emperor Qianlong for offering him welcome shade. The park was once full of the pavilions of the Imperial princes. The Round Town (or Fort) lies to the south and used to be an island, it houses a very large jar made of dark jade much prized by Emperor Qianlong. The Lake was re-dug in 1951 and the large white marble bridge at the south built in 1956 when it became a public park. On the island is the White Dagoba originally built in 1651 to honor the visit of a Dalai Lama; it was later rebuilt in 1741. For many years it was the highest point in Beijing and used as a lookout. It is a solid structure with no apparent entrance, it may contain Buddhist scriptures and sacred objects. The burial tombs of the Ming dynasty emperors are located 31 miles [50 kms] north west of Beijing. Just like the Egyptian pharaohs the Chinese emperors took great care to build and furnish lavish tombs for their afterlife. Although not on the scale of Qin Shihuangdi's tomb near Xian with thousands of Terracotta warriors, the Ming emperors did build impressive monuments. Emperor Wanli began construction of his tomb when he was only 22 years old with a budget of 8,000,000 taels of silver (a tael weighed about 1 oz [40 grams]) and it took six years to construct. The Ming Tombs (Míng shí sān líng literally the thirteen Ming tombs) are underground and not a great deal is to be seen above ground. They are spread along the valley sides a little like the Valley of the Kings ➚ in Egypt. Like most burial grounds in China the avenue leading to the tombs starts with an archway (a pilou) and is lined with large stone statues. These form the Spirit Way and are made up of twelve pairs of animals (camels; lions; elephants; horses; xiezhi mythical beast and qilin mythical beast). The beasts symbolize the breadth of the Empire. These are followed by twelve pairs of ministers and generals. The Ming Sacred Way is nearly 4 miles [6 kms] long. The tombs are located in a valley enclosed on three sides and faces south. This location was carefully chosen for the very best Feng Shui. The most impressive tomb is Chang Ling, the tomb of Emperor Yongle. Each tomb has buildings for preparing sacrifices, a tower for the commemorative stele and the tomb is covered by a mound of earth. The majority of the tombs have been left undisturbed, but Emperor Wanli's tomb (Dingling) was excavated in 1958 and various artifacts from his tomb can now be seen in a nearby museum. The tombs are laid out the same way as the palaces of the living with luxuries ready for use in the after-life. The Imperial Summer Palace Yíhé Yuán is 6 miles [10 kms] to the north west of central Beijing and should not to be confused with the Old Summer Palace 原明园 Yuánmíng Yuán that lies to its east. The palace was laid out by Emperor Qianlong as an alternative to the heat and claustrophobia of the Forbidden City. The site had been used by previous dynasties but he redesigned it on a far grander scale with scenic beauty in mind. The name Yihe Yuan can be translated as Garden to Cultivate Peace. The Qing Emperors traveled to the Palace by road or by boat along a specially built canal - the Chang He. It covers 716 acres [290 hectares] and most of the area is covered by lakes of which the largest is Kunming Lake. It is named ‘Kunming’ after a famous lake at Chang'an the great capital of the Tang dynasty. To the north-east of the lake is an area of gardens; temples and pavilions. The Bronze Pavilion; Temple of the Sea of Wisdom; Hall of Benevolence & Longevity and the Garden of Virtue and Harmony are all notable buildings. A 17 arch bridge leads majestically to the Temple of the Dragon King on an island of the main Kunming Lake. It was Dowager Empress Cixi who spent considerable money rebuilding the Summer Palace after it had been damaged in the Opium Wars and the Boxer Rebellion. She imprisoned the Emperor Guangxu here is 1898 after he attempted a coup after failing to make widespread reforms. Considerable money was spent on building a ‘marble boat’ for Kunming Lake - which is in fact made of wood but painted to look like marble (see Lay Osborn article for details of the controversy). Another famous sight at the Summer Palace is the long corridor that stretches 2,388 feet [728 meters] along the edge of Kunming lake decorated with 14,000 paintings on the roof beams some of these are of Hangzhou, a former Imperial capital. It was not maintained during the Republican era but since 1949 it has become a very popular public park. When the summer heat and dust became too much for the imperial court it moved to the fringes of Beijing. The Old Summer Palace, in China known as Yuánmíng Yuán Garden of Perfection and Light, lies to the East of the Summer Palace that replaced it; separated by modern development and close to Tsinghua University. It is a fragment of what used to be a much larger park. Qing Emperor Qianlong built a number of fine palaces set among gardens, hills and lakes on the site of a 12th century park. In a small area in the north-east corner, because he liked to collect the unusual and exotic, he set Jesuit missionaries the task of building some stone palace facades in the latest European style. These palaces housed many gifts brought from Europe to ingratiate themselves with the Emperor. Fragments of the ornate stonework can still be seen. Large lakes were dug and mature trees were transported hundreds of miles at great expense to be planted in the new parks. It was considered superior in design and elegance to the Summer Palace. The parkland palace bore the brunt of Anglo-French attacks in 1860 in the Second Opium War. A small party of foreigners had been taken prisoner while under a flag of truce and then taken to the Old Summer Palace and there tortured, some to death. The foreign troops then chose to assault the Palace in revenge; the choicest pieces went back to England and France, much was looted and destroyed but after it was abandoned in 1879 it was the locals who plundered the remains for stone; iron; wood and other materials. Parts of the original lakes and parks are now open to the public. The great open space set in the center of Beijing just to the south of the Old Imperial Palace (the Forbidden City) is called Tiananmen Square (Tiānānmén Guǎngchǎng) (literally ‘Gate of Heavenly Peace’). To the south is Qiánmén 前门 Front Gate. To the west is the ‘Great Hall of the People’ where the NPC meet, and there are museums to the east. It is a vast open space of 109 acres [44 hectares] and has seen rallies of a million people. The gate into the Forbidden City from which the square takes its name, was laid out in the Ming dynasty, it had a narrow path to the Qianmen (previously known as Zhèng yángmén) with a small open area in front of it. Most of the present square was covered with Imperial ministry buildings. It was called the Great Ming gate and had a mainly ceremonial function as it was only used for the rare excursions by the emperor, typically on his way to the Temple of Heaven just to the south. It has five archways, the grand central one reserved for the emperor. On exiting the Imperial dwellings the Emperor would make an offering to the God of Travel just outside the gate. Imperial edicts were delivered to officials at the gate, by lowering the scroll in the mouth of a golden phoenix from the tower; hence the expression ‘The Golden Phoenix promulgates an Imperial Edict’. The edict was copied onto Imperial yellow paper and dispatched around the empire. The area fell in to disrepair between 1860 and 1900. After the foundation of the Republic in 1912 buildings were demolished and it began to be used as a public space. Tiananmen Square's modern role as a large open space was promoted by Mao Zedong and it was greatly expanded in 1958. Each stone slab is numbered so that large gatherings can be carefully organized. It is the largest urban square in the world. Mao's mausoleum ➚ stands at the southern part of the square containing his mummified body laid out within a crystal case. To the south of the center of the square is a large modern sculpture to the ‘Heroes of the People’, it bears inscriptions by Mao Zedong (“The People's heroes are immortal”) and Zhou Enlai. Scenes sculpted commemorate the Opium Wars; Taiping Rebellion; the 1911 Wuchang Uprising; May 4th Movement (1919); May 30th 1925 demonstration against Japanese Occupation, and the crossing of the Yangzi by the PLA (1949). It is 120 feet [37 meters] high and weighs over 10,000 tons [9,071,850 kgs] and was erected in 1958. Since 1912 the square has been the place for national demonstrations, mass gatherings together with normal pastimes such as taichi and kite flying. The most important demonstrations took place on 4th May 1919 over the terms of the Versailles Treaty; the patriotic march of 18th March 1926 and 9th December 1935 against Japanese occupation when the December 9th Movement ➚ was formed. The square was the scene of the proclamation of the foundation of the Peoples Republic on 1st October 1949. The death of Zhou Enlai provoked demonstrations when wreathes were removed on 5th April 1976 (the ‘Tiananmen Square Incident’), this proved pivotal in the choice of Mao's successor and led to the downfall of the Gang of Four. Still politically sensitive are the events of April to June 1989 when it is claimed many democracy protestors were killed, a claim denied by the authorities. A lengthy student led demonstration was brought to an end by Army units on June 4th. The demonstration had started as a rally by mourners of Hu Yaobang, a reformist and former Chairman of the party. However, Deng Xiaoping decided to forcibly end the protests and as a result Zhao Ziyang was replaced by the more hard line Jiang Zemin. 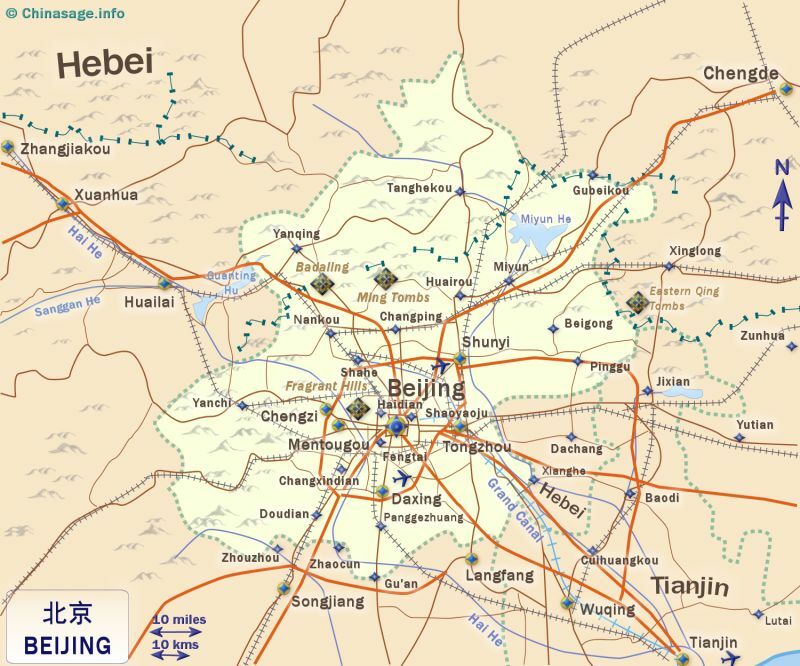 Citation information for this page : Chinasage, 'Beijing Capital City of China and municipality', last updated 29 Nov 2018, Web, http://www.chinasage.info/maps/beijing.htm.